I think that all I have to say is that I’ve already made these wonderful brownies three times before posting them! They are a great modification of the classic Southern cake- including the essential cream cheese frosting. The recipe was adapted from Fat Witch Bake Sale by Patricia Helding with Lucy Baker. Fat Witch Bakery is a family favorite NYC bakery, and one of the first we visited after moving to New York. I used semi-sweet instead of milk chocolate chips, lined the baking pan with parchment paper, and modified the baking time for a convection oven. I contemplated omitting the red food coloring, but it just would not have been as much fun. (…besides the fact that my daughter had a very strong objection!) 🙂 Yummy. Coat a 9×9-inch baking pan with cooking spray. Line with parchment paper and coat again with cooking spray. In a small heavy-bottom saucepan over low heat, combine the butter, sugar, and milk. Stir until everything is completely melted. Remove the saucepan from the heat and add the chocolate chips. Stir until everything is melted and well combined. Transfer the chocolate mixture to a large mixing bowl. Add the eggs one at a time and mix until well combined. Sift the flour, salt, and baking soda directly into the chocolate mixture. Using a whisk or electric mixture on low-speed, beat until no trace of the dry ingredients remains. Add vanilla and food coloring and continue to beat on low-speed until everything is throughly combined. Pour the batter into the prepared pan and spread evenly with an offset spatula. Bake for 22 minutes on convection, or up to 30-35 minutes in a standard oven, or until a toothpick inserted in the center comes out clean or with only crumbs, not batter, on it. Cool in the pan on a rack for at least 1 hour. 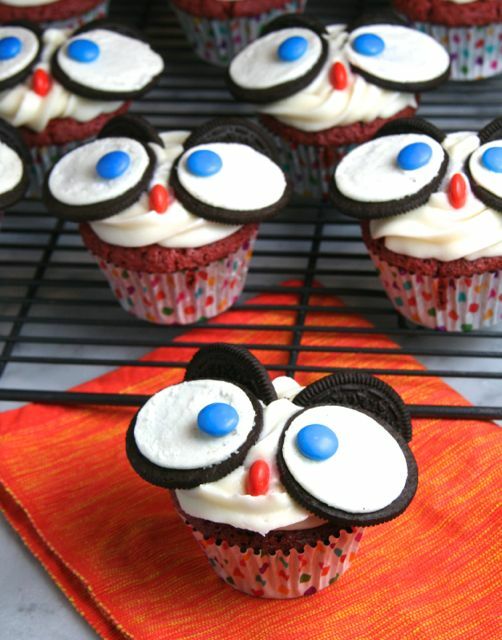 Make sure that they are completely cooled before frosting. 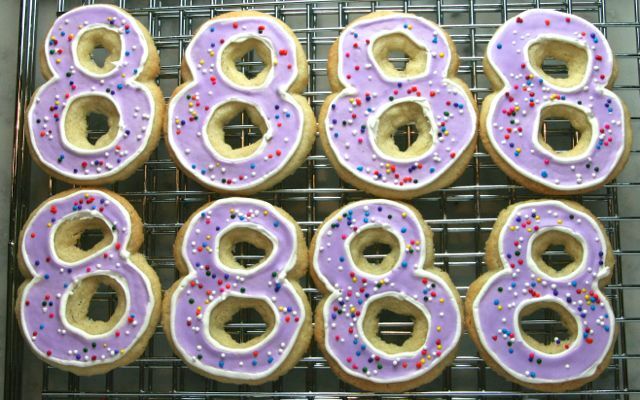 Note: This is a good time to bring the cream cheese and butter to room temperature before making the frosting. In a medium bowl, using an electric mixer, beat the cream cheese and butter until smooth. Sift the sugar directly into the butter mixture. Beat until thick and creamy. Transfer to the refrigerator to set the frosting. Cut the brownies just before serving. Note: The brownies will keep longer if they are stored uncut. Cover the pan tightly with plastic wrap and store in the refrigerator for 6 to 8 days. My daughter is so grown up for a second grader. She chose going to a Broadway show instead of a birthday party to celebrate her 8th birthday. She is a Broadway show tune junkie! 🙂 Another grown up choice was choosing red velvet cupcakes for her special birthday dessert. 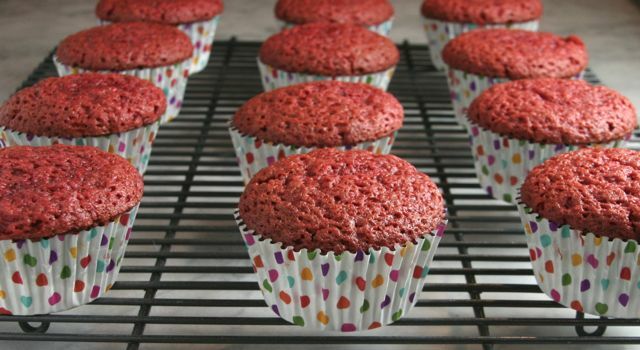 I thought that I wasn’t a red velvet fan- but these were super moist and wonderful. 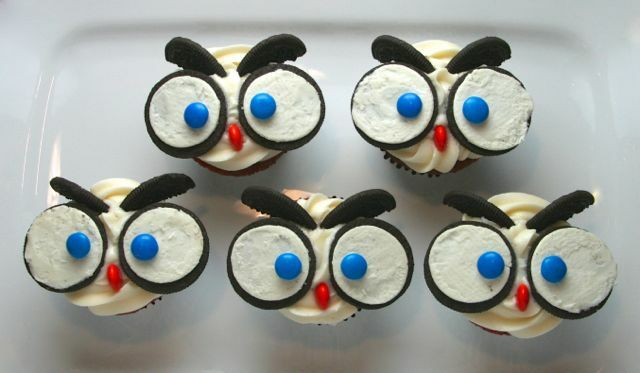 When we saw the owl cupcakes on Nancy Creative around Halloween, we both knew that we had to make them! I would say that the owl cupcake choice was the 8-year-old part of this birthday celebration, but I want them for my birthday too!! 🙂 The cupcake recipe was adapted from Martha Stewart Living. 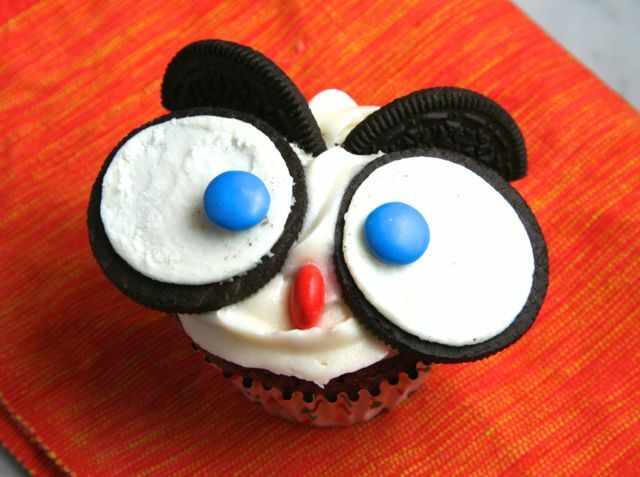 To make the owl’s eyes, I microwaved the oreos 3 cookies at a time for 7 seconds, but I still had trouble getting a clean split. I need more practice… I suppose it’s been too long since I’ve eaten oreos the right way! The eyeballs and beak were made out of m&m’s. The eyebrows are made from the remaining filling-less sides of the oreo cookies, scored slightly less than in half. Adorable! Whisk together cake flour, and cocoa; add salt. 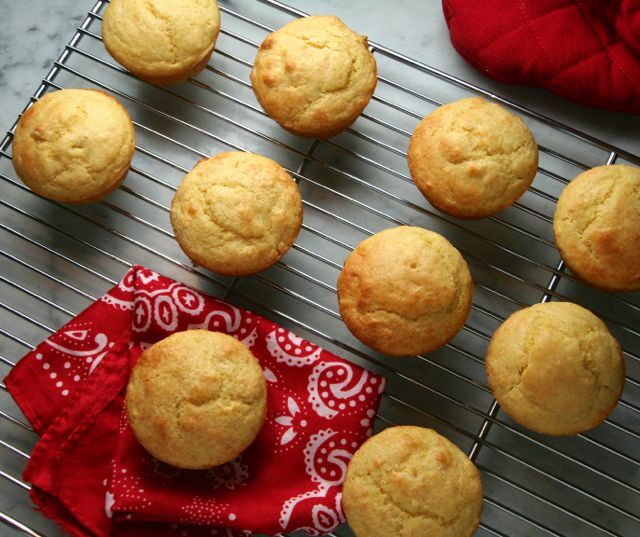 With an electric mixer on medium-high speed, whisk together sugar and oil until combined. Add the egg, beating until incorporated, scraping down sides of bowl as needed. Mix in food color and vanilla. Reduce speed to low. Add flour mixture in three batches, alternating with two additions of buttermilk, and whisking well after each. Stir together the baking soda and vinegar in a small bowl (it will foam); add mixture to the batter; mix on medium speed 10 seconds. Divide batter evenly among lined cups, filling each three-quarters full. Bake, rotating tins halfway through, until a cake tester inserted in centers comes out clean, about 18 minutes (on convection). Transfer tins to wire racks to cool completely before removing cupcakes. Cupcakes can be stored overnight at room temperature, or frozen up to 2 months, in airtight containers. 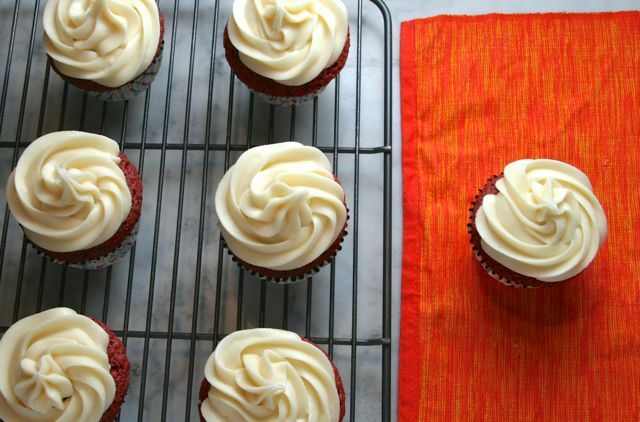 To finish, top with Cream Cheese Frosting (recipe below). Note: These are also wonderful as mini-cupcakes. Bake for 10 minutes on convection. Beat butter and cream cheese with a mixer on medium-high speed until fluffy, 2 to 3 minutes. Reduce speed to low. Add sugar, 1 cup at a time, and then vanilla; mix until smooth. Using a pastry bag with a large fluted tip, pipe onto cupcakes in a circular motion, starting on the outer rim. Another highlight of her birthday was that her class went on a field trip to a historic One Room Schoolhouse. She has been desperate to go on this trip because part of the fun is that everyone is supposed to dress in old-fashioned attire. She absolutely loves dressing up for everything- but this was particularly special because she wore one of my old dresses! (Thanks to her Nana who saves everything! :)) With a felt bonnet too. Super cute. The kids also bring their lunch in baskets- with each item wrapped in bandanas or cloth. She brought an apple, a buttered roll, dried fruit, and a buttered johnnycake. We had problems coming up with a vessel for her drink…. Makes one appreciate modern conveniences! Preheat an oven to 375 degrees (convection). Add the milk, syrup, oil, and eggs. Stir until just incorporated. Bake in a lined or greased muffin tin for 14 minutes, or in an 8-inch square pan for 20 to 25 minutes.